Oh my goodness. I’m going to stop making promises about getting these posts published in a timely manner. 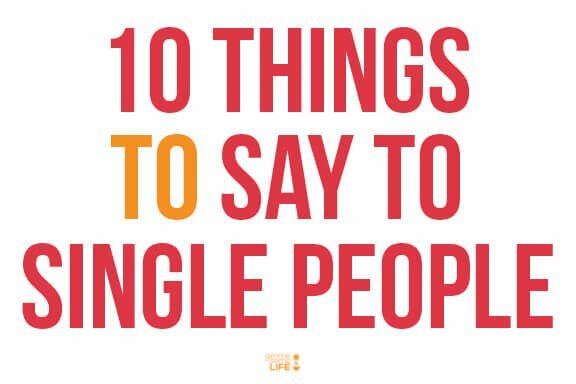 Life seems to have been crazy since I posted my list of 10 Things NOT To Say To Single People. But I’m finally back as promised with a follow-up post for what TO say to single people. I have to be honest, though. 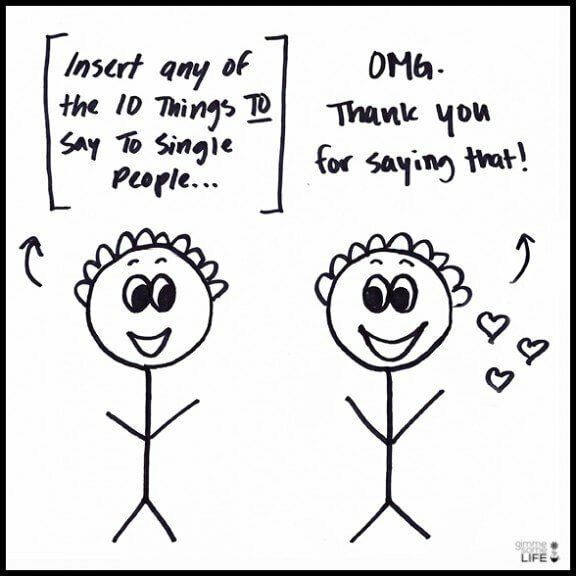 When I sent out an email to a bunch of my married and single friends awhile back asking for feedback on what to say and what not to say to single people, the response on the latter was considerably longer. Whereas, I initially only had a handful of points for this list. But I happen to be especially partial to the number 10 when it comes to lists. So boom. 10 it is. Alright, without further ado, here’s what TO say! Alright, we have to begin here. 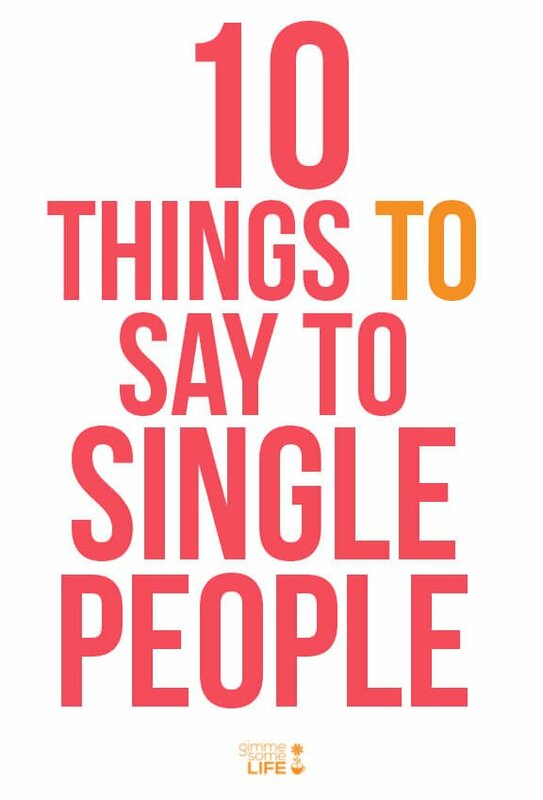 The most important thing in talking with a single person about being single….is whether they even want to talk about it at all! Some days I’m totally open to discussing it with close friends or family, but sometimes it’s just not the right day or I don’t want to focus on it. And I most likely don’t want to talk about it at all if I don’t know you that well. (Ok, minus broadcasting these blog posts to the entire world. :)) But bottom line – giving single people the option about discussing the topic is always a win-win solution. So if you’re curious, start with this simple question. It shows you care and aren’t afraid to bring the topic up, but also gives the single person an out they just doesn’t want to talk about it. And if they don’t – totally don’t take it personally, because chances are it’s probably not. On that note, most single people I know are way more interested in talking about the other things in their life than their single status. So I recommend anyone always start with all of the other important stuff in life like careers, travel, hobbies, friends, family, etc. Chances are, if your single friend’s relationship status has changed or is on their mind and they want to share about it, they will bring that up before you even have to ask. Probably the thing that bums me out most about being single is simply not having someone — the same person — to come home to and tell one another all about our days. Someone to notice the little things, and give feedback on them. Yes, I have many amazing friends and family members who I talk with on a daily basis who serve that role in a way. But it’s different than having the same person be there day after day who can be a constant witness to your life, and for me to be a constant witness to theirs. I honestly think that’s one of the things I hope for most in marriage. Just that simple constant-ness. So that said, it’s really meaningful when friends and family take notice of the smaller everyday things in my life, and then take time to comment on them. Anything from “I noticed you got your taxes done on your own” to “I noticed your dog’s cute haircut” to “I noticed you fixed that broken chair”. I know this is a good thing in any relationships, with those single or not. But trust that it’s really meaningful to your single friends. On that note, also complimenting single people on the little (and big) decisions they make in life can be really meaningful, especially as those relate to being single. It might be as simple as “I admire that you installed that new sink all on your own” to “I admire the courage you had to go out on that date”. Details, again, are good. But also commenting on the big picture is really good. I can poignantly remember a few times that people have looked me in the eye and said that they are really proud of the way I’m living a meaningful life as a single person, and it brought me to tears. Just because someone meant it, and took the time to say it. It means a lot. A lot of times I hear from married friends that they just want to do something to make their single friends feel encouraged, but they don’t know what to do. Again, this is a great question to ask of anyone, not just single people. But specifically for a single person, this simple question lets them know that you (also) think there are exciting things ahead for them besides the potential of finding that special someone. Dream, hope, brainstorm, plan, and get excited with them for what is ahead. I know that a lot of single people I know still make future plans with a bit of hesitancy, wondering/hoping if meeting someone would change those plans in any way. But even if that happens, hey, it’s better to have cool things in the works for if/when you would meet a cool person! So think and dream ahead together! A handful of my single friends requested that this be on the list. I’ve said this before, but just wanted to offer a simple reminder that it’s definitely not a “given” that being single automatically means that you’re wanting to date or meet someone right now. For any number of reasons, a single person might not be looking to date at the current moment, and might be perfectly happy and content about that. …out to dinner? …on a roadtrip? …to the grocery store? One of the things that comes with being single is not automatically having a partner to go places with you. Yes, it’s totally cool to do any of these things on your own. And yes, single people can totally take the initiative to invite a friend along. But it does take a little extra planning. So if you have a single friend, think about some of the small everyday activities that might be fun to do together. And if you are in a stage of life when you can get away for a few days, you might even think about traveling together. Any memories made together are always extra special! I like how my friend, Amanda, phrased this one. Alternate titles might be: “be picky” and “don’t settle”. I think a big misconception about single people is that their standards are too high, or that they are dreaming too big. At age 30, I think I can confidently say that my “list” of qualities I’m looking for in a guy have been dramatically reduced (make that, refined) from what they were 2, 5, or 10 years ago. I am far from dreaming that I am going to meet and marry the Perfect Prince Charming. If anything, I think that talking with married friends over the years has made me perhaps too much of a realist about marriage, and I sometimes have to remind myself that I’ll (hopefully) get to have that fun “honeymoon” stage of enjoying totally crushing on a guy before all of the little everyday conflicts or annoyances set in. So that said, I think single people need to be reminded far more often to dreaming “big” for a great match, rather than being chided to keep those dreams in check with reality. Remind them of who they are and who they want to meet. A little more (healthy) hope and dreaming in this area can go a long way for a single person. However you say it — You are a catch to the world! You are amazing! You are stellar! You rock my socks off! — I think that the best thing you can tell a single person is why they are awesome just the way they are. It may sound overly simplistic, or even cliche, but it is so true. And I think that hits at the heart of what single people — and all people — need to hear most. There are plenty of competing voices in the world and in the heads of single people trying to shout the opposite. And some days, when you’re feeling a little down, or lonely, or discouraged, or like you’re the only single person left amongst everyone you know, it’s really easy to let those other voices be the loudest. But the truth sets you free, baby. And when good people in your life remind you of the truth — that you are amazing, worthy, attractive, smart, talented, and a “catch” to the world — it changes you. Yes to all 10!!! I’d take these any day over your list of ten things not to say. Great job on getting your taxes done, by the way. I just wish people would make as much of a nondeal over being single as they do about people being in a relationship/married. I recently read a status from a friend who’s married with two kids about all the things that had gone wrong that day, and someone else who’s married with a kid responded: “At least you’re not single.” Seriously. There’s no reason to pity the entire mass of single people. Someone who’s unhappily single? Yes. EVERYONE? Of COURSE not! I just love this. You’re so wise. The worst part about being single is not having that partner to automatically do things with… especially when all your friends are coupled up. BRAVO!!!!! I love Number 5! There are so many other things in my life that I want to talk to someone about. Yes the lack of constant-ness is a bit of a drap, but when you keep your self busy with hobbies, you end up with at least one person in each hobby that notices your progress/ performance, and right there is someone who you can talk to. And who knows, they may need someone to be a “cheerleader” for them too, and that to me is way better then fulfilling my “need” for constant-ness. I admire you taking the time out of your schedule to share this part of your life with the world. I particularly like #3. I’m the type of person that tends to decline invitations to go do things because, I don’t know, I guess I like my alone time, but I always do appreciate the thought. You’re great Ali, I appreciate you and your blogs. Ali! I can’t thank you enough for starting this blog. At the age of soon-to-be 34 I haven’t had a serious relationship for the past 2.5 years. I have the best life and I truly do appreciate all the great things I have going for me… great family, great friends, my health, and a job I love. I feel so incredibly lucky; however, this is one area of my life that I struggle with every. single. day. It’s not even that I want to be married, I just so badly want someone to share my life with at this point. I want to find my best friend. Thank you, thank you, thank you for helping so many of us and showing us that we’re not alone! Oh my gosh; I so needed this today! Thank you so much for writing about being 30 and single. I’m going through a rough breakup right now and I think one aspect of it is that i’m about to be 30..and single. Yikes. This is absolutely perfect timing and I love reading all the comments..really helps as a reminder that we are not alone in this. Also, I love the dream big! I hate the idea of settling just to say I’m married..i’d rather just be single if it means i’m happy living my own life than with someone who isn’t right for me. Thank you again! #7 – I just love that, so good. Thanks for the reminder to look for ways to affirm others! As someone going through a break up that happened just prior to the holidays (natch), finding this series is just what I needed. I want to share it with all my single galpals! I may not be thirty quite yet, but this is just so, so nice to read. I’ve always admired your amazing recipes, and this series is just the cherry on the cake :) Thanks!! I wish no. 3 happened to me more. I’m dying to go out to places, but my friends & family never want to include me or most likely forget that I actually exist. Probably because they’re too busy hanging out with their married friends in their little “married clubs”. I’m not asking my married friends & family to make sacrifices for me, but at least a, “hey, how are you doing” can go a long way.